Students will use a variety of print, non-print, primary and secondary sources to explore social, political and economic factors that contributed to the end of the Cold War. They will also evaluate the role James Baker played in the political factors that caused the end of the Cold War. The teacher shows a video clip and facilitates a discussion about the iconic nature of the fall of the Berlin Wall. The teacher will introduce the historical investigation by telling students that they will be examining a variety of print, non-print, primary and secondary sources to determine what social, political and economic factors caused the end of the Cold War. It is optional whether students work individually, with partners, or in small groups. Based on students’ abilities and time constraints, the teacher may reduce or increase the number of sources students examine. The teacher distributes the Historical Investigation Graphic Organizer . 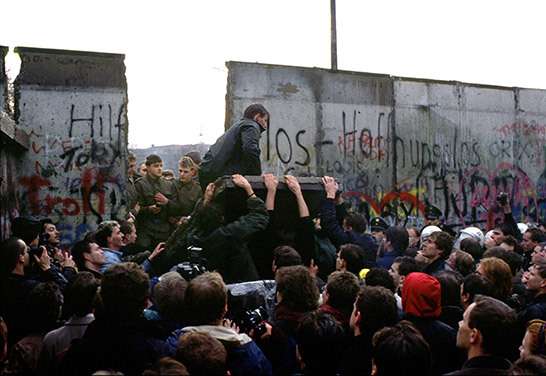 Have students research events listed on the geopolitical timeline of the Cold War. Students present their findings to the class to develop a comprehensive understanding of the social, political and economic effects of the Cold War. Identify and analyze the use of primary sources to explain the social, political and economic factors that caused the end of the Cold War. D1.1.9-12 - Construct compelling questions and explain how a question reflects an enduring issue in the field. D1.2.9-12 - Construct compelling questions and explain points of agreement and disagreement experts have about interpretations and applications of disciplinary concepts and ideas associated with a compelling question. D1.5.9-12 - Determine the kinds of sources that will be helpful in answering compelling and supporting questions, taking into consideration multiple points of view represented in the sources, the types of sources available, and the potential uses of the sources. D2.His.1.9-12 - Evaluate how historical events and developments were shaped by unique circumstances of time and place as well as broader historical contexts. D2.His.3.9-12 - Use questions generated about individuals and groups to assess how the significance of their actions changes over time and is shaped by the historical context. D2.His.4.9-12 - Analyze complex and interacting factors that influenced the perspectives of people during different historical eras. D2.His.5.9-12 - Analyze how historical contexts shaped and continue to shape people’s perspectives. D2.His.10.9-12 - Analyze and detect possible limitations in various kinds of historical evidence and differing secondary interpretations. D2.His.11.9-12 - Critique the usefulness of historical sources for a specific historical inquiry based on their maker, date, place of origin, intended audience, and purpose. D2.His.16.9-12 - Students integrate evidence from multiple relevant historical sources and interpretations into a reasoned argument about the past.